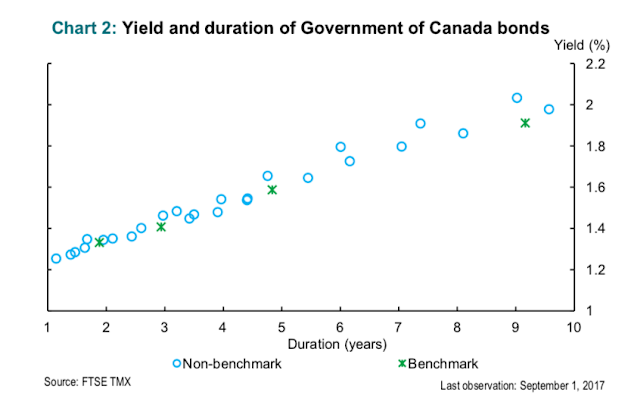 Canadian bonds, like US bonds, are liquid when first issued (on the run) but then become much more illiquid. Two wonderful graphs illustrating this phenomenon. The set of three perpetuities allows all government debt to consist of three securities, rather than hundreds in the US and over 70 in Canada, making each much more liquid. The classic example: A 10 year bond that is now 5 years old is a 5 year bond. But it carries a slightly different coupon than the current 5 year bond, and if you short one you can't deliver the other. So teh 5 year bond market is cut in half. A common objection to reallocating or simplifying the debt structure is that the current structure exists for a reason—to satisfy clienteles. Clienteles are groups of investors who have a strong or narrow preference to hold bonds with specific maturity dates or coupon structures..
...a government’s comparative advantage in debt issuance is its ability to issue safe assets and not its ability to serve clienteles. The government’s advantage in issuing safe assets derives from its ability to tax, which is a more reliable means to obtain revenue than that of most issuers. But the government has no special advantage in client service compared with private intermediaries, who are better positioned to work with clients because intermediaries are paid for these services.... The more standardized the securities in the debt portfolio, the easier it is for private intermediaries to assign payments flexibly to the clientele who currently prefers it. In contrast, securities designed to satisfy one clientele are forever less desirable to the others. In time, such securities may even become undesirable to their original targets. Without getting too conspiratorial, there is also the possibility that industry likes the current system because they like earning large bid-ask spreads on slightly illiquid securities, the bid-ask spread on frequent roll-over of securities (which perpetuities would end) and the lack of transparency in the current system. The paper is far too polite to say any of this. This is Canada, after all! the first idea is to reopen the issuance of scarce bonds, and the second is to conduct more switch operations (exchanges of less liquid GoC securities for new, more liquid bonds). 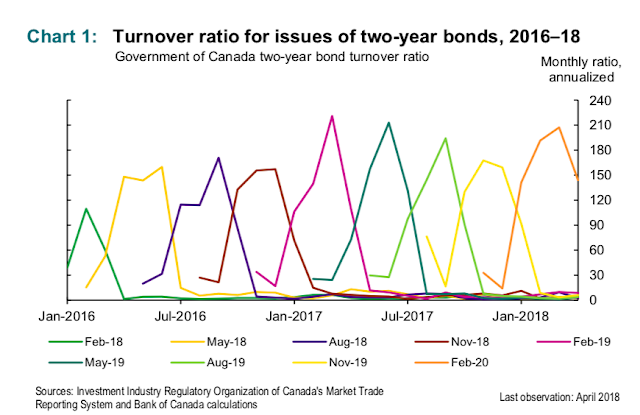 Without doing a dive into the data, I expect that the Canadian Provinces, Crown Corporations (like BC Hydro) and municipalities would probably benefit more than the Federal government from steps to make their bonds more liquid. One potential source of liquidity is the Canada Pension Plan which has sufficient resources and a long enough planning horizon to hold substantial inventories of illiquid issues to maturity. The paper asks why "strips" aren't more popular in Canada. I have bought strips in my retirement account for the last 30 years but I buy them intending to hold to maturity. I have bought 30 year strips (and have done well) but as a retail investor, my only market is my broker (one of the largest in Canada) and they quote a 5% bid ask spread for the long coupons. Congratulations to JC for contributing to this discussion! The proposed changes make good sense. As an aside and as an investor who occasionally dips into junk bonds when the risk-return proposition is sufficiently attractive, I appreciate any opportunity to learn more about debt markets. The smartest folks on the 'street' are the bond folks. It is impossible to understand equity markets without understanding debt markets. As for Canadians being too polite!?!! That has nothing to do with it. Civil servants with a strong sense of personal survival will either avoid altogether or tap dance around controversial politics. In other words the CANADIAN government can issue currency and hire any and all unemployed and underemployed folk. The constraint is the productive capacity of the economy, as measured by wage inflation. If prices do rise above an acceptable level, they can be controlled by i) selling government securities, ii) raising interest paid on deposits at the fed, iii) raising taxes across the board, or iv) a cut in spending. 4) The CANADIAN government debt is not a problem in any way shape or form. In fact, it can be repaid tomorrow without a negative repercussion. That would simply involve replacing government bonds with deposits at the CANADIAN CENTRAL BANK with similar interest and maturities. The similar or even better risk/reward terms assure no change in investor savings/spending preference or desire to hold dollars. Not recommending this course of action, just pointing out that it is possible. My basic point is that all the arguments for public borrowing are BS. Ergo there shouldn't be any. I get it. But I espouse "similar interest and maturities" to make it as much as a nonevent to the investor as possible. No interest may increase the propensity to spend and turn us into ---> Zimbabwee!!!!!!! Aaaaahhhhhhhhhhh!!!!! By owning Treasury securities the Fed transforms them into zero coupon perpetuals either as Federal Reserve notes in physical form or Reserve Bank Deposits in Electronic form. We have 4T$ of those. Another way to ensure that securities issues are the same at every maturity would be to fix the coupon, and make them fully amortizing. E.g. a thirty year self amortizing bond with a fixed annual coupon of $52,000 would, at current market rates sell for $1,019,223. The market price of these securities would change, and the implicit interest rates would change, but a thirty year bond issued ten years ago would be the same as a twenty year bond issued today. I could restate my proposal to be that the Treasury could issue IOs and POs only. Any two IOs with the same terminal date and any two POs with the same maturity would be fungible. The proposal by C. Garriott, S. Lefebvre, G. Nolin, F. Rivadeneyra and A. Walton, is akin to vaporware--a "projectionist" vision lacking substance and tangible evidence of benefits and costs. The authors claim that their vision(s) for the "bonds" in their schema remove the off-index variability in bond yield/price spread. So what? It's a secondary market effect only. As to the perpetuities that they propose, what could be closer to a true Ponzi scheme that the scheme that they outline in which there is no mandatory retirement debt date for the government? "Corey Garriott, Sophie Lefebvre, Guillaume Nolin, Francisco Rivadeneyra and Adrian Walton at the Bank of Canada have issued a thoughtful and crisply written proposal for restructuring Canadian government debt, titled Alternative Futures for Government of Canada Debt Management." "...investors will pay more in the primary market for assets they believe will be more liquid. Thus, issuing assets that are more liquid would decrease the issuer’s costs. ... a decrease in the total cost of funding of just one basis point would save the government $68 million annually"
Can you spot what is wrong with this thinking (especially since it is coming from central bankers)? First, the most liquid and least costly asset (in terms of nominal tax payer cost) a government can issue is currency. Take some paper, print some numbers on it, and buy something. So a bunch of people working for the Canadian central bank are what - looking for the Canadian Central bank to be replaced with the Canadian government?? Government debt is ultimately an entitlement program. Government can limit the cost of that entitlement by limiting debt issuance and / or negotiating a better price. Negotiating the best price puts the independence of the central bank at risk. the 'reopening' technique allows to consolidate subsequent issues with a prior one, at the same coupon, gaining therefore volume and liquidity. Initiated by the French state in the eighties, it is now common feature in the management of gov debt. Also, perpetual debt may be quite volatile. A $1 perpetuity is worth 20 if interest rate = 5%; 200 if 0.5%. So maybe better that it remain a small part of the government debt. This is just a question. For your proposal (2) for Canada, wouldn't the resulting financial instruments basically be competing with 30-year-bonds, and the English consols? The floating rate characteristic might open up some space, but it seems Mr. Waldblum is right, they would be hard to price.